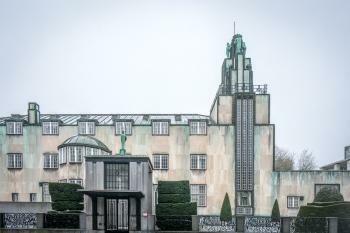 The Stoclet House is a private mansion designed by architect Josef Hoffmann and the Wiener Werkstätte between 1905 and 1911. It was built for banker and art lover Adolphe Stoclet. He gave them an umlimited budget and an artistic free hand. The integration of architects, artists, and artisans of the Wiener Werkstätte makes it an example of Gesamtkunstwerk, one of the defining characteristics of Jugendstil. 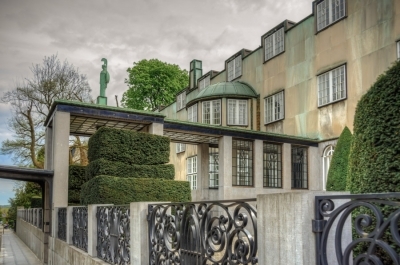 Although the marble-clad facade is radically simplified, it contains commissioned works by Gustav Klimt in the dining room , four copper figures at the top by sculptor Franz Metzner, and other craftwork inside and outside the building. Expensive materials were used all over, like Norwegian marble, gilded material and leather. The mansion is still owned by the Stoclet family and is not open to visitors. Since 2002 it is occupied by 2 caretakers. 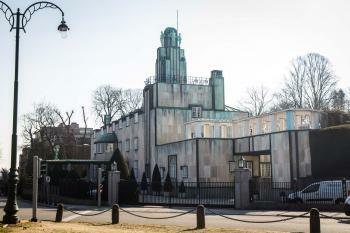 I arrived by car in the affluent suburb of Brussels where the Stoclet House is located. Lots of Embassies here, and ample parking spaces reserved for the privileged Corps Diplomatique. While looking for a place to park my humble Audi, I passed by the famous house no less than 3 times. I stole a quick glance every time, noticing with some excitement a female caretaker brushing away the leaves on the grounds (is she one of the two caretakers that live in the house?). Can I say that I find the exterior of the house extremely ugly? It almost looks like a factory among the more conservative villas in this neigbourhood. That greenish, almost weathered look. The total value of the residence is estimated at 100 million EUR - one would never guess that just from looking from the outside. 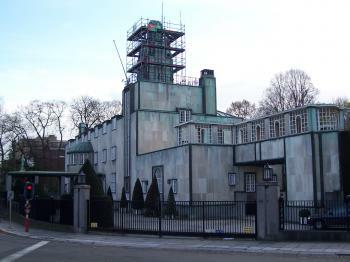 I read that the facade was intended to be austere, as to protect the private life of the Stoclet family. There's a huge fence around the house. However it's possible to take photos at different angles from the sidewalk. The tower, with the sculptures, seems to be undergoing restorations at the moment. 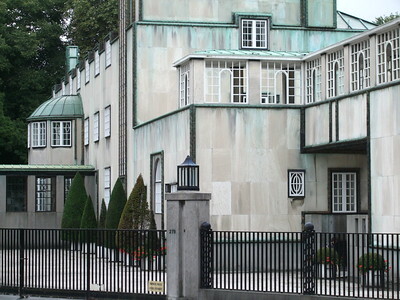 The house is situated at the Avenue de Tervuren 281. As every visit to this monument is a very short one, it's a good option to combine it with a trip to the (Central) Africa Museum in the nearby village of Tervuren. I had been there before: it's almost a museum about a museum. Since 1910, it has introduced Belgians to Africa (mainly to the former Belgian colony of Congo). Lots of stuffed wild animals. Stoclet has a Congo link too: Adolphe Stoclet used to be the owner of the Société Générale de Belgique, a Belgian holding and investment company with numerous properties in Congo (mines etc). At the moment the museum features an exhibition on the Ethiopian Omo Valley. It details the symbolism in the clothing, attributes and body decorations of the various Omo tribes. The museum also has an atmospheric cafe that serves African food. And that's where I ended this relaxing day out. There is very little that I can add to what the other reviewers said before me about this underwhelming site. The optics of bestowing a World Heritage designation on something that you can only view from a distance through the fence definitely feel wrong. It is clearly an unusual building - and all available descriptions of the interior suggest that it would be marvelous to explore - but until such time that it becomes possible, any visit would be unsatisfactory. That being said, checking this site off your list is pretty easy if you are already in Brussels. Stoclet House is located some distance from the city center, but a taxi ride there and back will not burn a hole in you wallet. The ride did not take 15 minutes one way. I got the driver to park and wait for me while I gazed at and took a few pictures of the building through the aforementioned fence for about another 10 minutes. At the current limits of accessibility, I have no problem counting the site as visited on the strength of making an effort. As many other people have noted in their reviews, this is an extremely frustrating site. Technically speaking, you can't really "visit" as it is privately owned and not open to the public. I tried pulling all the strings I could with the Brussels and Flanders Tourism boards (I'm a travel photographer) and there was nothing they could do. As far as I know only one group has been allowed in, in the last decade, and they were friends of the owners. What is especially frustrating is that the facade of the structure doesn't even face the street. What you can see is actually the back of the house. From everything I have read, the interior of the building is stunning and it is really worthy of world heritage status. Until the family can come to some sort of resolution, we have to wait visit this fine building. Read more about the Stoclet House on my website. I have a real problem with this place - how can you have a World Heritage Site that is basically inaccessible to the public? Shouldn't the point be that the general population gets to see and experience the wonders that history has left us? But then, at the same time, if something is worthy of being listed should it not be included just because it is private. Maybe that's the thought process. Either way, it's disappointing and annoying to me. You can see the exterior from the street but that's not really a good enough way to appreciate the architecture of the place. I hope something might change at some point in the future - the local authorities buying it and opening it, for example. I visited this WHS this Summer 2012. It can only be viewed from the outside as it is a private residence. The main entrance is being restored but the rest of the site is in a very good shape. It looks quite strange and unpleasant to the eye at first but it was built this way on purpose to deter passers-by from the artistic treasures it houses inside. The fact that it was inscribed as a WHS prevented the owners from altering or demolishing the whole site to sell the land for some multi-storey building or yet another embassy to be built. It is truly unique and hopefully in the near future the owners will decide to open parts of this WHS to the public. I must admit that I only visited the Stoclet house because it’s on the list and I want to visit as many sites as possible. I’m not sure if it was a wise decision to inscribe it on the list yet. I somehow have the romantic idea that a “World Heritage” should be accessible to the world, which in April 2010 was still not the case. From the few existing pictures I know that the interior must be magnificent, but all one can see by now is a not incredibly exciting façade from only one side of the house. I rather felt like a stalker than a tourist, going there and taking a few pictures. The good thing about the house is that it’s in Brussels, a city with three other WHS. So if you’re there stop by for a moment. It’s an easy one to tick off your list. Unfortunately that’s all. This private residence is located just outside central Brussels, a short walk from Montgomery metro station. 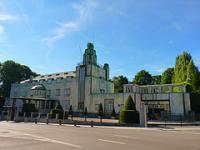 It is a fine example of Secession architecture, (this was the Austrian Art Nouveau School). Its straight lines show the emerging influence of modernism. It was designed by Josef Hoffman, and there was a large input from other craftsman such as Franz Metzner who sculpted the four figures that crown the top of the building (unfortunately hidden behind scaffolds when I visited). As this is a private residence at the moment the only thing that can be seen is the exterior. However, as with the nearby works of Victor Horta, the interior is what makes this house so incredible. It is dripping with mosaics by Gustav Klimt, the most famous of which are in the dinning room. Photos of them are hard to come by but here are a few including the dining room which seems to be incredible. All aspects of the house were designed in unison so the mosaics, furniture, light fittings and even cutlery are all designed to complement each other. The close collaboration of all the craftsmen, artist and architects make this a real Gesamtkunstwerk. Unfortunately the future of the Palace is in jeopardy, whilst the exterior is protected the interior is not, and it seems that three of the four great grand daughters that now own the house are wanting to sell of the mosaics and paintings. This is a good article that details the ongoing family dispute regarding the property and its contents. I sincerely hope that this property can be added to the World Heritage list, it is a candidate in 2009, and hopefully this can help keep the building and all its contents together. Hopefully this may even open up the interior so more people can see this incredible work of art. Not open to tourists: Privately owned, and only very few people have seen its interior. In private ownership: AB "The House and its garden are the property of the real estate company 'Suzanne and Adolphe Stoclet' (SAS), formed by the descendants and heirs of the founders, of whom there are seven. The furniture and art objects are their personal property." 194 Community Members have visited.